That was the nature of my daughter Rehtaeh. She was like that her whole life. I couldn’t go for a walk in Halifax with her without her asking me for change to give to someone in need. She was always looking out for people or animals that needed help. She called Animal Control Services on our neighbors because they left their dog outside too long. Her room and her life was always full of little creatures. 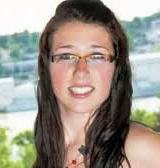 Rehtaeh died April 7, 2013 at 11:15 PM. She was 17 years old.